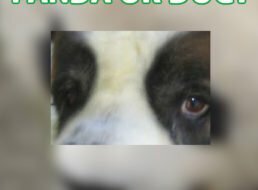 We saw this picture of a dog named Barkley, and we were taken by his panda like face. Wait for a moment and with 10 seconds the solution will pop-up! Please share this to your social network account, using the sharing buttons to the left, or below. We hope this pic amused you! We thought we would have a bit of fun, so we made up a picture to puzzle our visitors.